The folks over at Right Field Bleachers are encouraging people to go out to the ballpark next Wednesday to cheer Geoff Jenkins as a thank you for his time here in Milwaukee. Jenkins was a class ballplayer who never complained about his contract and never complained about the direction the team was going, despite the train wreck of a front office that was here for most of his stay. 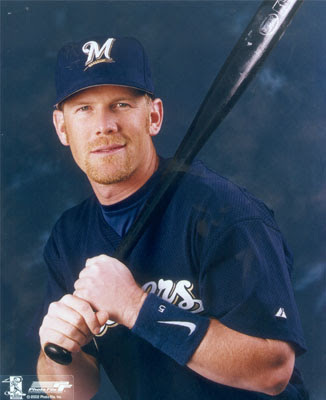 He was the sole bright spot of an embarrassing era in Milwaukee Brewers history. The game is part of the 5-county promotion that the Brewers put on. You can get in for half price if you live in the area. Go out there and say thanks. An interesting debate has flared up in a forum at Brewerfan.net about the merits of cheering or booing Jenkins at next week's game. I've never understood fans who boo players simply because they leave for another team. If you are going to boo a player like Jenkins who left as a free agent, then you ought to give the same treatment to guys Mike Cameron, Eric Gagne, and David Riske, because they did the exact same thing - just to someone else. It doesn't make any sense. If you're out there booing Jenkins, you certainly have every right to. But then I also have the right to think you're an idiot.